Powers/Abilities: Able to separate his spirit from his body, enabling it to act independently. While unfettered by his mortal form, his spirit can grow to giant size, fly, become invisible and has superhuman strength. However it remains vulnerable to injury inflicted on its corporeal counterpart, and if the body is killed, so too would the spirit. History: Having spent 25 years in Tibet as a student of the Grand High Lamas, an unidentified American returned home armed with their magical knowledge to fight crime. Adopting the alias Phil Anson, he would separate his spirit from his body to become Phantasmo, Master of the World; since his mortal form remained his main vulnerability, he hired bellhop Whizzer McGee to look after his body when he was elsewhere. Comments: Created by E.C. Stoner. 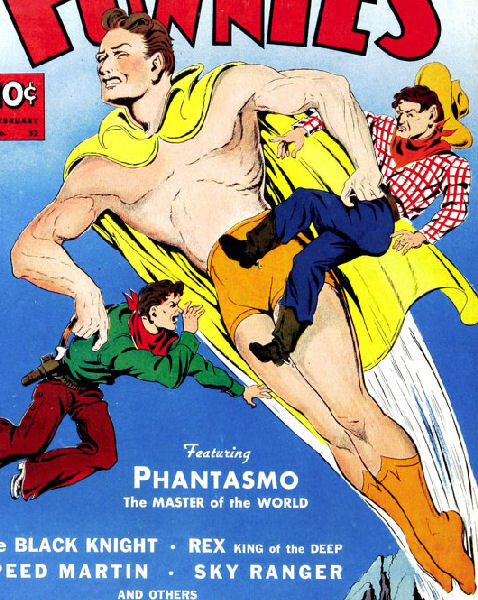 The first Dell superhero, Phantasmo appeared in The Funnies #45-63, being the cover star up to #56, jointly sharing the cover with Captain Midnight on #57, who thereafter took the main cover spot from him.